I toured two large, commercial scale produce food hubs, the State Farmers Market in Atlanta and the Hunts Point Food Distribution Center in the Bronx section of New York City (NYC), both of which occupy considerable real estate acreage, tucked away in their city’s backwaters as work-horses, employing lots of people. Each food distribution center is located in a lower rent district and on government supported properties. In total these food hubs with their satellite operations, feed about one-third of the U.S. population. The 168-acre Atlanta Market is located beneath Hartsfield International Airport’s flight path on state-owned land but is strategically located within minutes of the interstate highway system to whisk food to southeast markets. 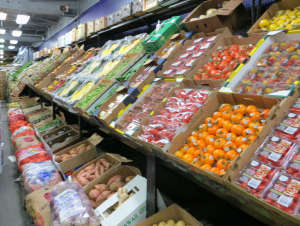 Supported by the New York City Economic Development Corporation, the 329-acre Hunts Point Center is in one of NYC’s lowest income neighborhoods in the Bronx, but is well-placed to serve 20 million eaters in the New York metropolitan area, notwithstanding the rest of the northeast market. Despite food being vital to my health and wellness, I did not know where my produce could travel and I was fortunate to learn so much on these two visits. The State Farmers Market in Atlanta is a state-owned food hub which leases facilities to private businesses which aggregate, distribute, and market edible products throughout the southeast. On Saturday afternoon in April, the western half of the 168-acre state market is sparsely filled with small, independent vendors selling everything from giant stuffed animals, boxes of produce, and packaged goods to a handful of customers. The Georgia Department of Agriculture has redevelopment aspirations to build a more vibrant, thriving market here, which will only happen when money and legislative-will are found. The eastern half of the property is home to private food distribution businesses that collect food from the two major southeast growing regions—the Piedmont region, a higher elevation with more clay-like soils and the coastal plains, an area with abundant water and superior growing soils–and other national and international markets to supply a burgeoning food economy. 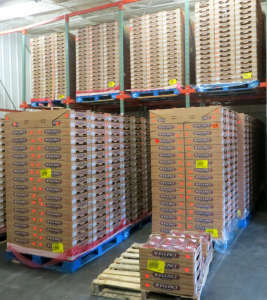 General Produce, a privately held company located on the State Farmers Market property, occupies four warehouses with 178,000 square feet of space and serves eleven states. Cal Folds, one of the owners and members of the founding family led us on the tour of the more than 50-year old business. General Produce is a 24-hour operation sourcing and delivering fruits and vegetables to grocers, institutions, and restaurants in their own company-owned satellite equipped tractor-trailers from this central location and four other smaller facilities. 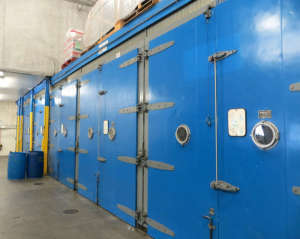 What was most intriguing was General Produce’s 22 banana ripening rooms! The average American eats 10 pounds of bananas per year! (Calculate it! The U.S. population consumes more than 3 billion pounds of bananas per year!) Bananas arrive green from Central America. To hasten the ripening process bananas are placed in ethylene-filled boxes for three to five days to achieve the yellow glow. Ethylene is considered the “ripening hormone” which naturally occurs in apples and pears, but can be chemically formulated for creating the optimal banana! I was wowed by the Atlanta Market but didn’t know another mega-food market was in my future. I arrived in NYC after a non-stop cross-country flight on an October Sunday evening. I willed myself to be at a 6 a.m. Monday morning bus departure to ride to the sprawling Hunts Point Food Distribution Center, a 329-acre wholesale food market with the new Fulton Fish Market, the Hunts Point Cooperative Market, the New York City Terminal Market, and a multitude of other food-oriented businesses. Skies were just starting to lighten, when a busload of 45 Urban Land Institute real estate professionals arrived at the bustling New York City Terminal Market–the produce market. About 50% of the City’s produce moves through the 660,000 square foot warehouse space stretched along four narrow buildings, which if laid end to end would stretch more than one-mile long. Just the Terminal Market generates 3000 jobs and $2.3 billion in sales. In the wee hours, long-haul trucks lumber down the driving areas between the buildings lining up to park perpendicularly to the open-air loading docks delivering fresh product. At our 7 a.m. arrival, the larger trucks had left and the smaller delivery trucks were being filled with orders of fruits, vegetables, and packaged goods to be delivered to restaurants, convenience stores, schools, and other customers throughout Metro NYC. In the pre-dawn light, not wanting to disrupt commerce, our group wound its way between hawkers, piled high dollies, and awaiting trucks. We slipped into Joseph Fierman & Son, Inc., a long-established potato, onion, and other root vegetable sorting and distribution business. Huge bins, and 50 pound boxes and sacks of potatoes were awaiting processing. 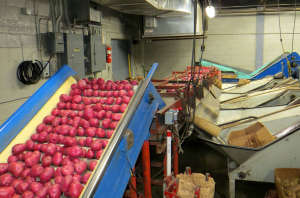 Once placed on the conveyor belt, the tubers were mechanically sorted and dropped into sacks rotating on the automated, analog-scale, packaging machine. In the pristine, all-concrete room, the clickity-clack of the machine was rhythmic, but noisy. As the sun was starting to brighten, we walked across the truck staging and maneuvering area to the Tomato Division of Armata Fruit & Produce. Tomatoes were rolling down a conveyor belt (with an occasional bounce) and each orbs’ color was assessed by an electronic sensor directing the fruit to the appropriate chute and an awaiting box with similarly colored fruit. As boxes filled, workers stacked them by readiness for market, with greener-hued tomatoes needing more maturing prior to store delivery. The Armata spokesperson said the 40,000 pound batch of tomatoes from Williams Farms that we were watching would be processed within three hours. Armata expected to sort tomatoes from two more farms by the end of the day! About 9 a.m. we arrived at Baldor the pre-eminent NYC food supplier with $400 million in annual sales. Baldor is the New York, Boston, and Washington, DC “go to” food supplier serving hotels, restaurants, private schools, and retail. I was so impressed by Baldor that it deserves its own story. As a kid, my Dad taught me to grow tomatoes and took me blueberry and strawberry picking. My grandmother lived in rural western New York and I picked U-pick apples on her neighbor’s farm. I have a 5,000 square foot city lot with a plum tree, blueberry bushes and over-wintering garlic getting ready for the next agricultural season. I visit the University District Farmers Market regularly. I get my food from many different retail outlets. However, visiting the Atlanta State Farmers Market and Hunts Point and feeling the pulse of the thriving wholesale food economy is incredible and so different from anything I had ever experienced. Watching the workers swiftly move large quantities of perishable, tender product that must be appealing to the eye as well as the stomach is astonishing. The food distribution story is unknown to most, but an important to appreciate. Our eating culture is dependent on ensuring this system flourishes, as having abundant, good-tasting, nutritious food is vital to a healthy community. Next time you eat asparagus begin to imagine how it got to your plate!